"On January 29, 2019, Amnesty International published "The Tourism Industry and Israeli Settlements," a report alleging that "the Israeli government has political and ideological reasons for developing a tourism industry in occupied East Jerusalem and Area C of the West Bank." According to Amnesty, "Israel has constructed many of its settlements close to archaeological sites ... [as] part of an active campaign to normalize and legitimize Israel's increasing control of the OPT." This publication is "part of a broader campaign of BDS to bolster the forthcoming UN BDS blacklist. Amnesty denies Jewish connections to historical sites – including in the Old City of Jerusalem – and in essence faults Israel for preserving Jewish historical and cultural heritage, as well as places that are holy to Christians. (Further), by suggesting that foreign tourism to Israel is about supporting settlements, not about religious and/or historical interest, Amnesty International erases the Christian connection to the Holy Land." This past weekend, on January 26th, 2019, the Pittsburgh Theological Seminary sponsored its 21st Racial Justice Summit. The third panel of the day was titled "Rewriting the Narrative: Reimagining the Future." Someone in attendance wrote to me, in a small panic. She is afraid to be quoted by name but sent me a video of the third panel which, quite frankly, frightened and appalled her. I have now viewed most of it. And I share her concern. Yes, Pittsburgh is where the abominable massacre of eleven Jews at prayer took place last fall. One might expect a heightened sensitivity, especially among justice-seeking Christian theologians. One's hopes would be misplaced. Sadly, few progressives are willing to understand the connection between Jews and Jewish Israel, or the way in which the issue of Palestine is being used to defame Jews and incite large populations of aggrieved justice-seekers to potentially exterminate the Jews—yet again. "Initially, when Zionism was born in Europe it was a political movement that was conceived by wealthy Jewish businessmen in eastern Europe and the idea was to establish a Jewish homeland. When all these Zionists started immigrating to Palestine and eventually took over the country and kicked the indigenous people out, the narrative was that these Europeans who had been in Europe for thousands of years, who had documented European history for thousands of years, in literature, and art, and culture, in science and politics, that these people were actually indigenous to Palestine and the indigenous people who had been there were, in fact, the squatters..."
"The earliest story was that Palestine was a land without a people, for a people without a land. We didn't even exist in that original narrative. The story of a land without a people, for a people without a land was so enticing to the west, it was the perfect ending to their own crimes. It was a happy ending. It was romantic. Three-quarters of the population had been expelled and pushed into refugee camps and were not allowed to return while Europeans and Jews from all over the world continued pouring into Palestine. We were going from one port to another, we were waiting in camps. It was only when Palestinians started highjacking planes that the west was like, oh wait, there's such a thing as Palestinians. And so we exerted at least our presence in the late 60s and early 70s through violence, through violent resistance. "And so then the narrative switched. It was Palestinians are terrorists. Now that narrative has persisted to this day. As long as the world can believe that, then everything Israel does is ok with us. As long as people believe that Black men are thugs, gangsters, mass incarceration is ok. As long as people can believe that Iraqis had WMDs or that they oppress their women, whatever, going in and destroying that beautiful, sophisticated, high-functioning ancient society was ok. Likewise, in Libya, in Afghanistan, in Syria. So narrative is where everything begins. It's where cruelty begins. So now Palestinians have, because we live in a diaspora, many of us ended up in western countries, like myself. And we've learned western languages. And we begin to rewrite our narrative. In the same way that once Black America was able to get an education, they produced this whole canon of literature and culture and actually defined the culture of this country." One does not know where to begin. But notice how seamlessly Abulhawa equates the Palestinian situation with that of Black Americans. Notice how she minimizes the oppression of women in Muslim and Arab society. Above all, notice how she fails to mention the 850,000 Mizrahi and Sephardi Jews from Arab and Muslim countries who had been second- and third-class citizens and who were finally forced to flee with only the proverbial shirts on their backs when they were finally forced out. Perhaps Abulhawa should view Pierre Rehov's film The Silent Exodus. Abulhawa's first novel, was titled "The Scar of David" (2006, 2010) and is about an Israeli soldier stealing an Arab (Palestinian) child and giving the boy to a "Polish Holocaust survivor" in Israel. It was re-titled "Mornings in Jenin" and has since been translated into twenty-seven languages. French philosopher, Bernard Henri Levy, described the book as "a concentration of anti-Israeli and anti-Jewish cliches masquerading as fiction." In turn, Abulhawa discredited Levy as a "French pop star of philosophy and intellectual elitism," which is not exactly an issue-based rejoinder. Insults, not facts. "We respected the Palestinian civil society call for Boycott, Divestments and Sanctions (BDS) against Israel...(our purpose) was to bear witness to the destruction and appropriation of information about Palestinian pasts and presents and to support efforts to preserve cultural heritage...(we were) eager to dispense with the superficial and inaccurate portrayals of life in Palestine/Israel that we see in the West and to learn about the realities of life under occupation and settler colonialism." Mguni's Solidarity statement consistently refers to "1948 Palestine (Israel)." It describes a horror-landscape of "checkpoints and watchtowers, metal detectors, and settler militias." It discusses "Israeli apartheid and colonialism." 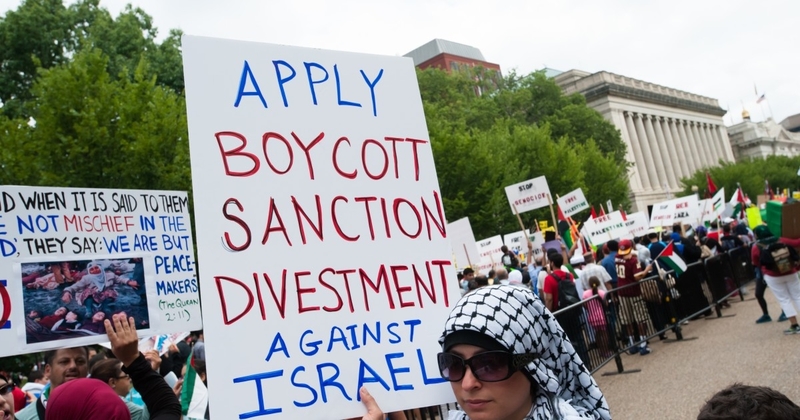 Not all Palestinians are thrilled about the global BDS movement against Israel. Perhaps the librarians might read Palestinian activist and journalist Bassem Eid's analysis of this. The statement talks about visiting "the rubble of villages that were destroyed in 1948." As a librarian, Mguni is particularly upset by the "erasure of Palestinian culture and history (which is) a tactic of war and occupation." Then there is this: "In Nabi Saleh, weekly nonviolent demonstrations against the confiscation of the community's land and water are met with extreme violence from the Israeli military." More: If these librarians had only dared read Tuvia Tenenbom's Catch the Jew! they would understand the nature of the Potemkin Villages that the Palestinian Authority and Hamas in Gaza create for visiting journalists. The media is shown only staged events—and then threatened with death or the destruction of their equipment and notes if theyreport anything else. Mguni's delegation was particularly interested in a Palestinian museum dedicated to "challenging the process of ethnic cleansing and the erasure of cultural memory... We learned about the articulation of Palestinian-specific understandings of sexual identity, and the Singing Sexuality project, which discusses sexuality through music." As a "Black unicorn" she fails to mention the profound homophobia on the 'West Bank' and in Gaza and the fact that Palestinian homosexuals routinely flee to Israel for asylum (which is, invariably, granted). The Solidarity statement fails to mention the increased misogyny and oppression of girls and women in Gaza and on the 'West Bank'. The statement does not include honor-based violence, honor killing, forced face veiling, child marriage, or polygamy as part of the "indigenous" Palestinian culture. However, these Lies have been told so often and so well that they now constitute Holy Doctrine. Their presence is repeated almost everywhere (in classrooms, at conferences, in reviews of published books, online, in the media, at the United Nations). Lately, the momentum seems to be accelerating. As a friend put it: "Hatred sure rides a fast horse." Sitting at my desk, I receive countless, endless, examples of how religion is being confused with race; how Palestinians are being confused with African-Americans; how the history of slavery in America and South African Apartheid are both being confused with alleged European "settler" colonialism—especially in a small part of the Jewish Middle East. Private emails—daily—continue to confirm that Jewish Israel is being demonized and endangered at progressive and gay gatherings—even when such a conference has promised not to do so again; Listserv groups whose mandate is another subject entirely (psychology, women's rights, the environment, gay and lesbian rights), continue to choose Palestine over Israel and to bring it in no matter what else is being discussed. Nothing is objective or fact-based. Everyone has their own "narrative." All things are subjective and relative. Oddly enough, this is all in the service of the most dreadful conformity. Racially, ethnically, and sexually marginalized American populations are brandishing propaganda about Palestine as a shield in their own battle against Western white supremacy. Phyllis Chesler is the author of eighteen books, including two about honor killing, a 2013 recipient of the National Jewish Book Award, and a Ginsburg-Ingerman Fellow at the Middle East Forum.